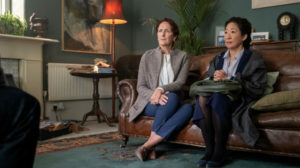 Killing Eve continues as Eve investigates a new female assassin and Villanelle recovers from her injury while setting foot in England. There was a tantalizing moment in this episode when we thought Villanelle and Eve would finally see each other again but it is too soon for that fateful confrontation. Instead, we have that slightly frustrating scene of Villanelle driving off in a car, her face leaning on the window and gazing at Eve who is too distracted to notice. Picking up where the Killing Eve premiere left off, Villanelle made her way to the UK in the trunk of a car. She wanders around a suburban neighborhood, weakened by her trip and needing serious medication. After stealing some clothes at a laundromat, she goes around a supermarket and tries to find a gullible stranger to help her. She finds Julian, a seemingly harmless man who takes pity on the poor, lost girl that Villanelle plays so well. It was also a lot of fun to watch Jodie Comer act using an English accent for once because she sounded more natural and at ease. But even a cunning assassin can be taken by surprise and it was perhaps because Villanelle was weakened by her injury that her instincts were not as sharp as usual. And it is a bit refreshing to see Villanelle out of her element and stripped of her usual complacency and resources. We have no doubt that she will find a way out of her predicament but she will have to work a bit harder to do so in her current state. The twist on Killing Eve is that Julian is a huge creep and a terrifying kind of Nice Guy™ who has a collection of dolls all over his house and keeps his mother locked up. This was a horror-story setup and I was just relieved that Villanelle was a ruthless killer and not the innocent girl she was pretending to be. Julian clearly underestimated her and their ensuing fight was scary because we weren’t even sure that Villanelle would win because of her injury. And just like last week we saw her killing Gabriel as an act of twisted mercy, this week I was just relieved to see her murder Julian. I don’t even want to imagine what he would have done to her if she had stayed longer in that creepy dollhouse. If she ever had a deserving victim, it was this one. Villanelle later meets her new handler, who wastes no time in asserting his dominance. For all of Villanelle’s less savory characteristics, it still bothers me to see her being subjugated by a man. Not that she will put up with that when she’s fully recovered. Killing Eve is not just a thriller about an MI6 agent and an assassin but also a show that explores the female experience. Eve has to deal with sexist microaggressions at work while Villanelle regularly contends with even more insidious sexist threats. Both of them are strong and capable enough to overcome these difficulties but this doesn’t make men less dangerous. Eve’s half of the story followed the main plot as she and Carolyn investigated the murder of internet magnate Alistair Peel. When the method of his death turns out to be too subtle and careful than Villanelle’s style, Eve posits that there is another female assassin at large. Eve proves just how competent she is at understanding the mind of female assassins, despite her partiality for Villanelle. The new assassin is code-named “the ghost” and when Villanelle finds out that she’s not the only one good at her job. The episode ends on a cliffhanger where Carolyn invites Eve over only for the latter to be greeted by Konstantin. The plot thickens and the game continues.